I’m usually QRV from home, DLØTUM & DKØMN club station (rather seldom) and as a guest operator at DL1A/DJ6ZM superstation (unfortunately QRT). And I love operating portable from an Alpine summit. Still under construction. The plan is to install GAP Titan DX on the roof. We were living in a skyscraper in Munich close to the beautiful Olympic Park. The only possibility to get QRV at home has been to set up an antenna on our balcony. I wrapped a ten meter long copper wire around a robust fishing rod fixed on the railings (see pictures). 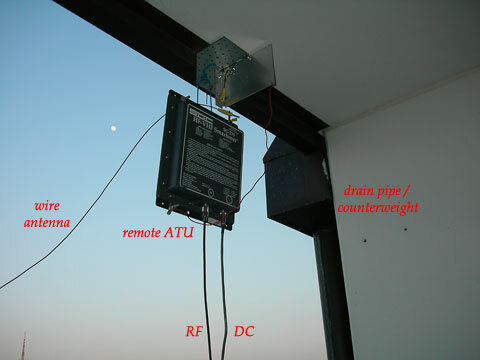 As an antenna counterweight I utilized a drainpipe running along the right wall. For matching purposes I 'm using either the remote SG-231-HF-VHF smartuner, especially in summer, or internal ATUs (see pictures). This very simple and short wire antenna shows a quite good performance on 40, 30 and 20 meters, and a quite acceptable one on 80 meters and high bands. From the balcony there is an open view towards the East, but I also had no problems to pick up hundreds of stations from the North and South America during an ARRL contest, although the antenna is completely sheltered from the West. The main problem has been heavy daytime QRM. 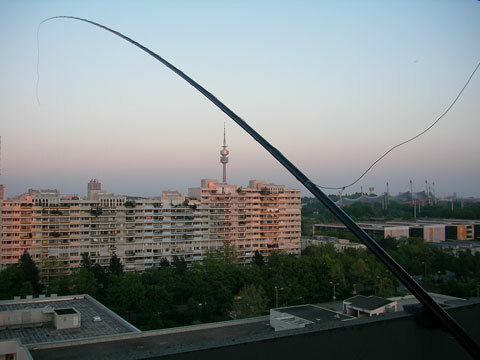 For the local FM communication I used a homebrew dual band J-antenna tailor-made from a piece of 300Ω twin lead and pinned to the curtain and actually having a good SWR on the VHF/UHF bands. You might have hear me via DBØVM (438.975 MHz) or around the 145.500 MHz FM calling channel, sometimes I had my FT-7800 running in background. ... matched to 50Ω by a remote SG smartuner.